Beef Osso Buco for sale. Buy online at Zingerman's Mail Order. Gourmet Gifts. Food Gifts. Osso Buco is a nineteenth century Milanese dish that, luckily, has never gone out of style. It’s a cut of shank, cooked for hours in a slow braise of wine, tomato, carrots, celery, and onions. After that long, slow cooking, the meat falls off the bone with the slightest nudge of a fork, and the flavor is deep, rich, intensely savory, huge. Served with polenta, risotto, or mashed potatoes, it’s the ultimate comfort food. 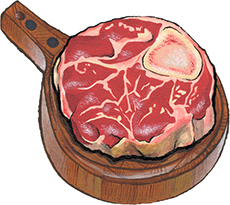 Traditionally osso buco is made with veal. What we have here is raw beef shanks, ready to cook up to make a flavorful beef osso buco. Where a veal osso buco is soft and mild, far more delicate, this is big and beefy, with a tender meat that pulls away from the bone like brisket. You can dial up the spice content in your braise and not worry that it’s going to take over the flavor of the meat. Made with beef from cattle that spend their whole lives out on pasture, roaming free with their herds, in central New York state. They're never given growth hormones, sub-therapeutic antibiotics, or steroids, and they never step foot on a feed lot. Ships frozen. They may thaw and be cold, not hard, when they arrive.